For those of you new to Dinofarm, we are a very small development team responsible for developing the quirky iOS Rogue-like100 Rogues back in 2010, and most recently our first self-published title, the innovative tactics game Auro. When I say "very small," I mean literally two to four people at any given time. My job title is Lead Artist, but a more accurate description would be "One-Man Art Department." Animation, character design, graphic design, industrial design and illustration are all separate, equally demanding disciplines. As the team's only artist, I am forced to take on all of these and more, as the task requires. Not only is it impossible to do all of these things well or even competently, but in the chaos of indie development, some entire disciplines get overlooked altogether. For us, one such discipline has been Branding. When we started development in 2011, I didn't even know what branding was; nor did I have time to learn. That, combined with making Auro's assets over a four-year-long development cycle, resulted in our brand being somewhat... all-over-the-place, to say the least. 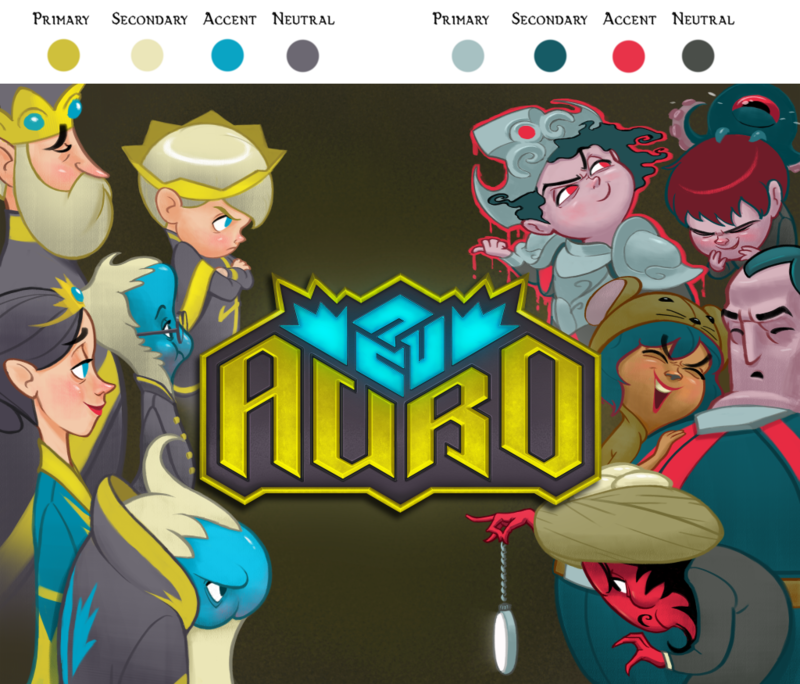 Recently, our lead designer began work on an exciting new expansion for Auro, for which there is a live Kickstarter Campaign right now. That expansion, coupled with our upcoming PC release, presented me with an opportunity. 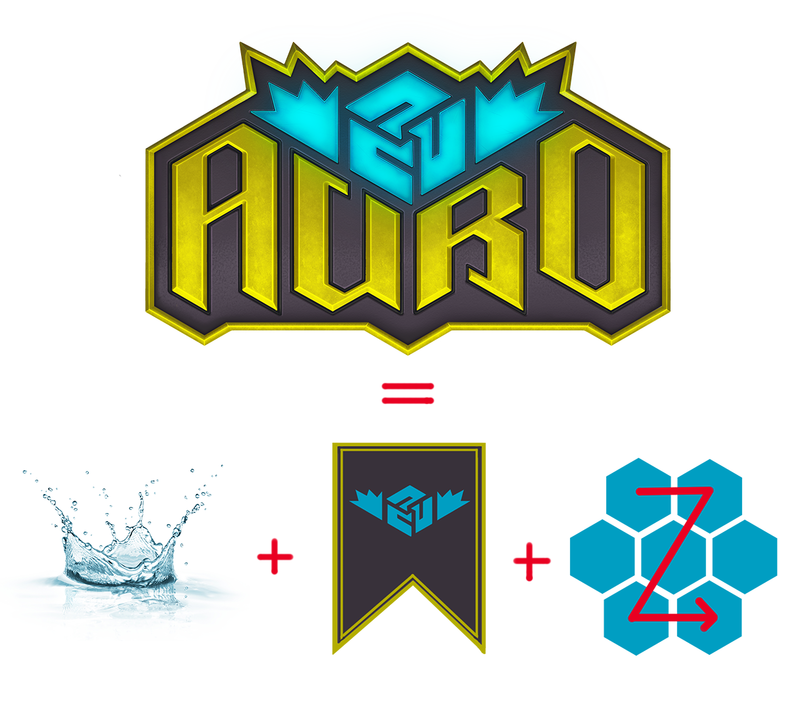 I decided it was time to begin implementing a complete rebranding of Auro from the ground up. If you are another developer like us whose only resources are time and elbow grease, trust me: you can't afford to make the blunders I did. If you're an animator saddled against your will with the task of branding, or an illustrator with no graphic design background tasked on logo detail, hopefully this article will save you some precious opportunity cost, and maybe some sanity as well. If you asked me what a brand was in 2011, I might have answered with something like, "It's the logo, right?" or perhaps, "It's the name of the product, right?" As it turns out, it's not that simple. Being totally out of my depth, I looked around for useful articles on the subject. "Put simply, your 'brand' is what your prospect thinks of when he or she hears your brand name. It’s everything the public thinks it knows about your name brand offering—both factual (e.g. It comes in a robin’s-egg-blue box), and emotional (e.g. It’s romantic). Your brand name exists objectively; people can see it. It’s fixed. But your brand exists only in someone’s mind." The first major distinction brought to my attention was the difference between "brand name,"
For me, the big takeaway was the word "intangible." A brand is the part of the product that "speaks to you." It's the part that becomes a component of your identity. The brand is not the cola you're drinking, it's the experience you come to expect in regards to the product. According to this ad campaign, what you're buying is happiness, not corn syrup. The "intangible" power of a good brand can be formidable. Sometimes, a brand can be even more important than the product itself. A popular example that comes to mind is what Steve Jobs did for Apple in the late 1990s. After being fired from Apple in the 80s, the company lost its way and was on the verge of collapse. Jobs was asked back to restructure the company as interim CEO. I'm sure anyone my age remembers the famous ad campaign. As Steve Jobs elaborates in this internal meeting with Apple, if Apple keeps on going punch for punch with Microsoft on bits and bytes and megahertz, they will lose every time. Instead, he played a different game. With Apple, you're not being sold a computer. Rather, you're being sold the promise of your own genius, innovation, and creativity coming to fruition. Remember the commercial? 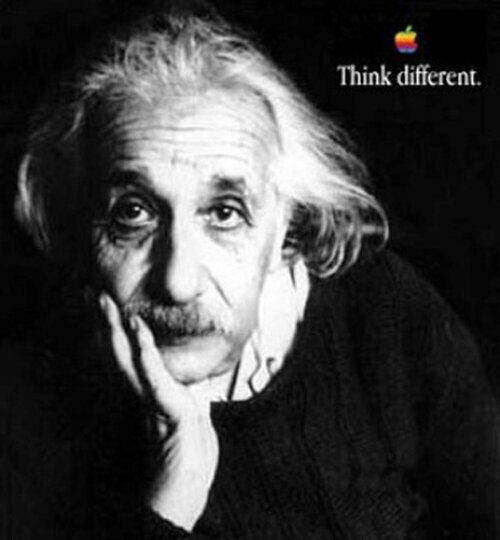 Jobs' "Think Different" campaign literally brought Apple back to profitability inside of 3 years (well, that and a $150 million life raft from Microsoft). That's the power of branding. Another reason branding is so important is simply for the sake of clarity. A confusing product line can cripple you. Many Hollywood films have tanked due to the wrong marketing angle or title. Apple's comeback wasn't just a new slogan. 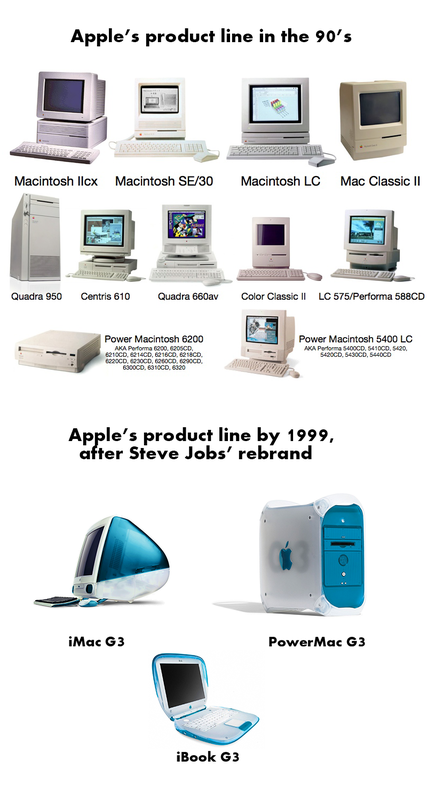 During Steve Jobs' absence, the nomenclature and product line of Apple was a mess. Consumers were confused. They didn't know what to buy or how to discern one model from another. A couple of years into Jobs' second tenure, the slate was wiped clean. Check out the difference. The new "i" nomenclature was not only simpler and easier to understand, but it reinforced, from the "think different" campaign, the emphasis on the computer as an extension of the individual. I know there are many mixed and strong opinions about Apple products, but no matter if you're on team Apple or team PC, or whether you love or hate the divisive Steve Jobs, one thing is undeniable: homeboy knew how to brand. Those three big, blue, goofy looking computers were certainly not confusing anybody. If you saw one of those in a store, at the very least, you raised an eyebrow. You might think "Oh, how cool. What's that all about?" or "Oh my GOD, is that a computer or a baby toy?!" Either way, you'd know it was an Apple. When you look at your own work from four years ago, you can usually see its age more than anyone else. Needless to say, I have my own personal reasons for wanting to revisit a lot of Auro's visuals. 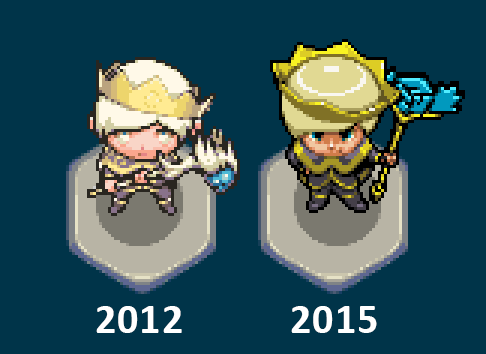 However, Auro's branding issues go deeper than an out-of-date sprite here or there. Besides the obvious fact that we never really had a coherent branding strategy to begin with, when we began conceptualizing the game, we were already serving multiple masters in terms of what we wanted to accomplish. That's always a bad start. While Auro's gameplay was barely designed back then, we did know it was going to be a "boiled down" dungeon- crawling Rogue-like with an emphasis on tactics. 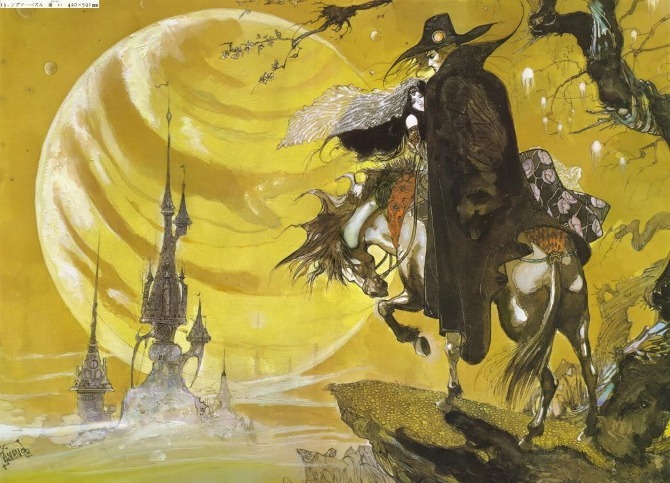 When I came in to establish a visual style, I wanted to theme the game to invoke "arty," Yoshitaka Amano-esque, classy Japanese fantasy art(with abysmal success). The images above simply don't contain any information about what kind of game Auro is. They're too thematic, and not specific enough. It could be a point-click adventure game, a JRPG, or maybe even a cartoon show. Worse, the title, Auro: The Golden Prince, crosses into downright confusing territory. What's an Auro? I learned the hard way that, when naming a video game specifically, it's important to convey mechanics first, theme second. (Except in the case of licensed titles. The gameplay doesn't matter at all if you get to play as Batman). Especially in this ultra-dense market with hundreds of new games per day, the concept needs to enter the user's head like a bullet. What's Flappy Bird? Well, you're a bird, and you're flapping. This lack of specifics or indication of mechanics were the ill-conceived beginnings that generated years of content that we had to make sense of after the fact. This resulted in a bit of a visual hodge-podge that I now have to clean up. By 2013, we actually had the core of Auro's gameplay designed.The premise is simple: bump monsters into the water for points. Use tactical magic spells to achieve crazy chain reactions and emergent depth. With Auro, the devil is in the details, and in reality it's a very deep, serious strategy game. However, the "bump the monsters and make them go splash" concept is easy to grasp, so we started thinking along those lines. Once you get the hang of it! This led to our first attempt at cleaning up our brand back in 2014. We changed the subtitle, The Golden Prince, to A Monster-Bumping Adventure. However, since we were scrambling to get the game out the door, this was sort of a stop-gap. It wasn't until recently that I have been able to give more of my attention to the greater overhaul. 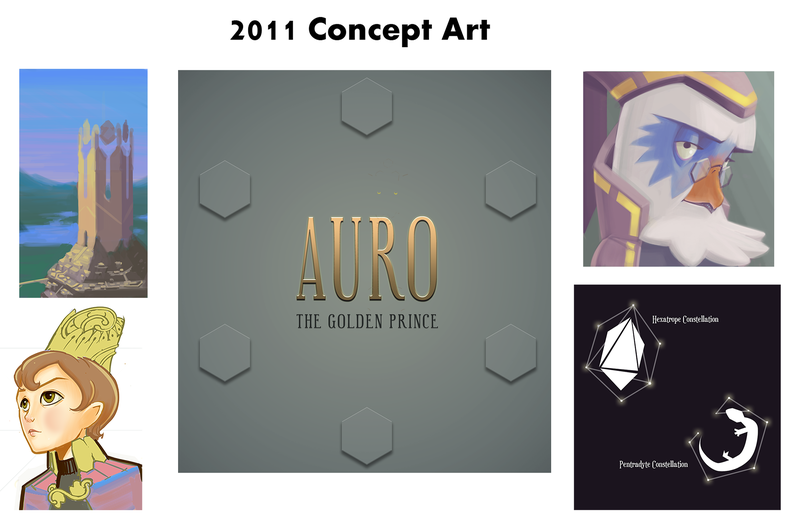 As you've seen from the image at the top of this article, I designed three logos for Auro over the course of three years. I'm sure it's obvious that I am not a graphic designer, not by any stretch, though since I had no choice but to fall on my face again and again, I picked up a thing or two by sheer force. If you can afford a graphic designer, hire one. If you can't, at least pay for a consultation. If you can't do that, hit up a graphic design subreddit or forum for feedback. Whatever you do, don't just wing it, which is what I did. Each version of the logo represented at least a hundred hours of work, the nitty gritty of said work you can read about here if you'd like. No matter which way you slice it, rendering and painting take time. If you have a misguided composition, bad anatomy, or in the case of the first two logos, awful graphic design, you will waste labor--and lots of it--in the rendering phase. If it's not apparent, you might ask what makes those first logos so bad. Well, I'll do my best to explain. In the interest of time, let's say that every criticism I level against the 2014 logo can be applied tenfold to the 2012 logo. Speak to me: Logos need to not only be clear and legible, but ideally they should also contain free information. In other words, it has to tell me something about what I will be experiencing. The 2014 logo, while not devoid of information, doesn't really say anything to me about the experience I'm about to have. what comes to mind? 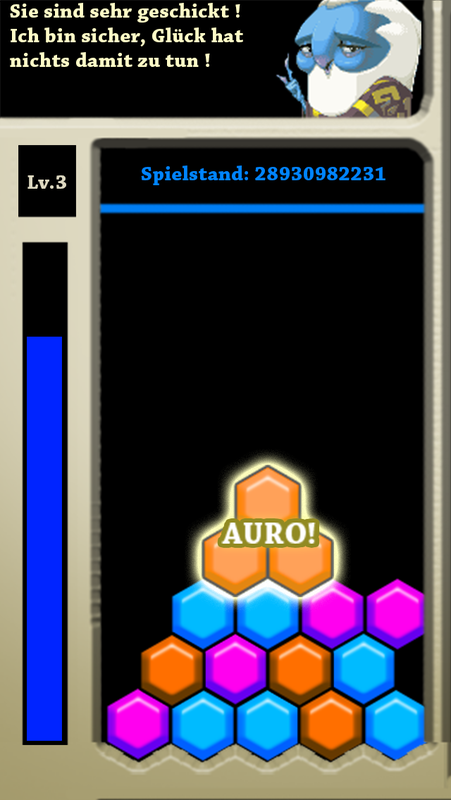 All we really have to go on is the word "Auro" and that hexagonal icon. One could interpret this many ways, perhaps into some kind of abstract European match-three game? One thing is for sure, we certainly don't get much in the way of a tactical fantasy-themed dungeon crawler about bumping monsters into the water. The original concept was not without some reasoning. The "synergy icon," as we've come to call it, was conceived to illustrate something about Auro's world. 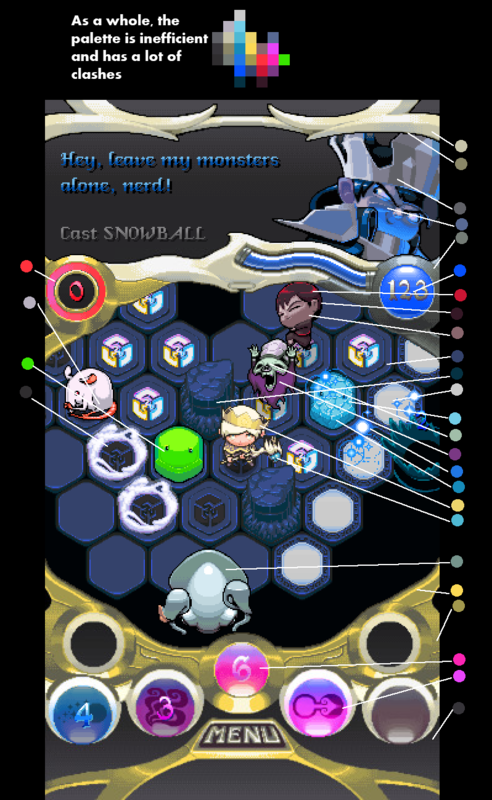 In Auro, you do combine ice, fire and wind themed spells, you do traverse a hexagonal playfield, and the swirling lines do suggest tactics and movement. That said, you could also take this symbol to mean any other number of things due to the lack of specifics. Then it hit me. This new icon is an improvement in many ways, but the most noticeable is the obvious addition of the splashes on either side. This new icon does the same job as the last, but it adds just enough specificity to do a very important job: to tell a story. Now, in this new graphic, the original suggestions of tactics, movement, and hexes convey the means by which the goal is achieved. The splash and overall "downward," shape of the icon then suggests the actual win condition/goal. Further, it suggests a royal seal, which gives a little more insight into the theming and the world. 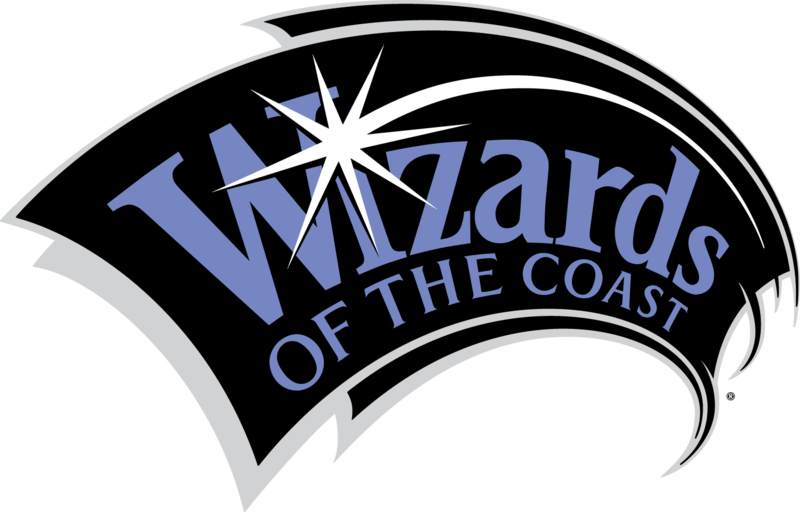 So, when you see the old logo, the information you get is tactics on hexes, and maybe mixing. 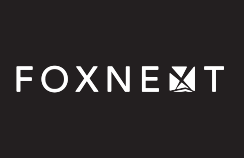 With the new logo, you get some juicy specifics: splashing, royalty, and tactics on hexes. Reduction: Especially considering our world of tiny screens, reduction is crucial. What I mean by reduction is the ability of your logo to remain clear and intact at smaller and smaller degrees of magnification. The old icon had a lot of problems in this area. Below is a breakdown of how this was addressed. Badge: The original two logos were letters against negative space. Without knowing it, I gave myself a mountain of problems. A white logo with no outline or badge is a huge hassle when it comes to placing it over images. If there isn't a big enough area of negative space for the logo to sit, it becomes illegible. With a badge, you can put the logo any old place you want. Efficiency: Finally, if you notice the invisible outer silhouette of the logo, there isn't much rhyme or reason to it. More specifically, many of the shapes and angles aren't committed. To really invite the eye and take it on a little journey through your logo, there must be a lean logic to the angles and shapes. In the old logo, I had no concept of this. There is a loose hierarchy, but so many wasteful lines that clash with others. 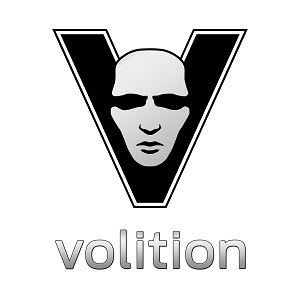 In the new one, there is a clear "dominant" angle, which "splashes through" the entire logo. All shapes are uniformly iterated and deliberate. Other angles support the dominant angle by contrasting with it enough so as not to get in the way of it or clash with it. This way, every shape pulls its weight. This is one of those "you may not know it, but your brain does" phenomena. I'm sure any real graphic designers reading this are rolling their eyes with a hearty "no duh." I'm sure I'm getting some terminology wrong, and I'm sure they would still see a million things wrong with the new logo. But remember, I'm an illustrator/animator who has to wear a graphic designer's hat from time to time. At the very least, perhaps I can give anyone else in my shoes a little hope that, from "ghastly abomination" may someday come "not terrible." In an astonishing turn, my recent article, "A Pixel Artist Renounces Pixel Art," exceeded my wildest expectations and went viral (by our standards, anyway). Though a vast majority of the commentary was a celebration of my greatest heroes, in the interest of demonstrating my points, I took a few cheeky pot shots at some game art. You know what? They're absolutely 100% right. We had early concepts about color coding monster types which we ultimately didn't need, but the colors stayed anyway. As new rules and design changes emerged, characters and locations were rethemed and recolored. The end result turned out to be kind of a mess in terms of a unified palette. Through the course of development, I learned a lot about color theory, thanks in large part to Color and Light by James Gurney, which I highly, highly recommend. 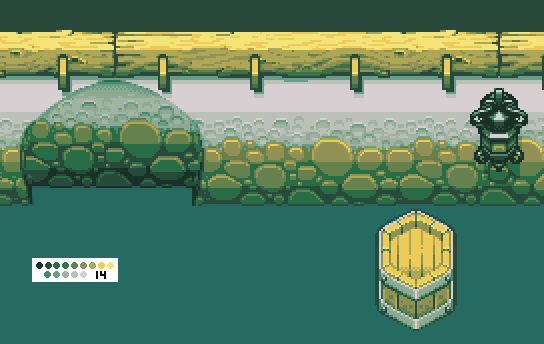 I also began taking a more diligent interest in pixel art, which led me to the den of geniuses over at Pixeljoint. 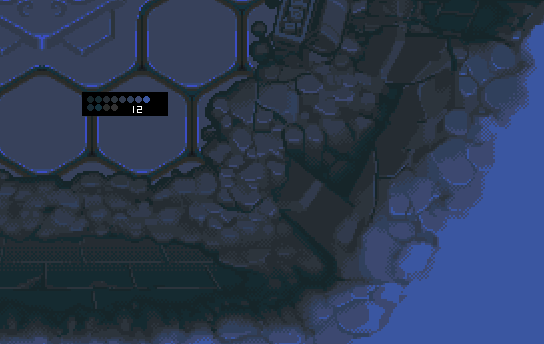 Because of this, many of the mid-to-late assets for Auro had controlled, harmonious palettes on an individual basis. However, in line with branding, that doesn't amount to a hill of beans if the whole work doesn't stand up. I decided to address this head on, and after tons of work, here is the first look at Auro's official palette and makeover for the main factions. Primary: The dominant color that most gives something its identity. Accent: Usually, the accent is a louder, brighter color that pops and adds spice. It's usually sparse so as not to overwhelm or distract from the primary. Neutral: Even if it's not true gray, it functions that way. The neutral is a benchmark by which all the other colors gain their identities. From here, exceptions will be made, colors will be blended and added as needed, but the important thing is, now we can get serious mileage out of these colors. We know not to go too far outside the palette or to choose colors that fundamentally clash with them. It's a roadmap to a more cohesive look. Not to mention, in a game where you're taking on a "team" of monsters, it's very useful to have a clean relationship. "Good guys = Blue and Gold," "Bad Guys = Red and Silver." While we're not out, we're certainly down in our Kickstarter Campaign. You never really know why with these things, but personally, I think it's difficult to convince an audience why they need an expansion for a "mobile game." By now I think it's pretty well-established, the mistrust and cynicism for "mobile gaming." The ire towards"freemium" games reached such ubiquity that there was a South Park episode devoted to it. You're really good at this, guy! We wanted to convince gamers that there was an option for real "video games" that happen to be on mobile, as opposed to their concept of "mobile gaming," and all the nasty stereotypes associated with it. We wanted to present as a "killer app" for mobile devices. 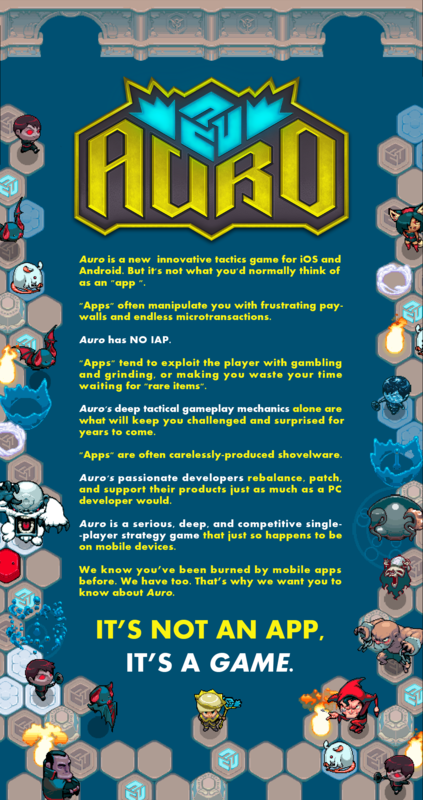 Auro aims to be the Tetris to the iPhone's Gameboy in terms of replayability and emergent depth. Like all indies, we can't compete in terms of scope or budget, so we have to instead emphasize gameplay above all else. Unfortunately, it's just too far gone. The pay walls, the exploitative microtransactions, and many other slimy strategies have gotten out of control, and there is simply no public trust. This is totally understandable. We're in a "boy who cried wolf" state when it comes to marketing actual hand-made strategy video games on a mobile device. (with notable exceptions--I'm looking at you, Outwitters). Auro is really a PC game at heart, and in retrospect, we should have started on PC. Though this Johnny-come-lately realization cost us a lot, it also dropped something in our lap. Sometimes a massive negative public perception such as is the case with "mobile gaming," can work to your advantage. Steve Jobs gave up trying to prove that Apple was better than its competitors, instead focusing on how it was different. The big public conversation about underhanded freemium sales models is basically free information. When we ask, "You know those sleazy mobile apps?" Everyone already knows what we're talking about. From there, it's a small step to say, "Auro is the opposite of that." It's important that people learn the rules of Auro to really understand what makes it one of a kind. However, it's equally important to get people in the door. This requires a line of trust in a market where there is none. That is why establishing that Auro is nothing like the public perception of mobile gaming is essential. That, aside from releasing the PC version, is our best shot at finally finding Auro's larger audience, which is anyone who loves tactics and strategy gaming. We've only done a fraction of what needs to be done. From here, I will slowly begin replacing and updating relevant art assets until the entire game ripples out from the core of our new branding. While this is a monumental challenge, things started to come together when I thought of this rebranding. Once you have a brand you can work with, it has a cascade effect, informing your content. See Auro's new staff? Once I worked out the new logo, the staff essentially designed itself. That's one example of the domino effect I hope iterates through this entire process. That domino effect is precisely why it's so imperative for those indies who haven't yet considered branding to do so. We underfunded pixel jockies need all the "work smart, not hard" we can get.